Day 24. I am improving again. The feelings I had before I overdid the exercise are back. My legs are feeling sturdier, stronger. My mind is clear. I feel happy, uplifted. I am not trying to increase my step count, but I am trying to improve my quality of health. I am on a juice feast which is also helping me to feel better. Day 25. As I get close to the end of the 30 days, I don’t want the challenge to end. I am enjoying the feelings of improved health from the E3Live products. Day 26. Today I was marching around the house getting steps in. Later I put on a Leslie Sampson walking workout. I found my muscle control has improved. My coordination is better. It feels like I am more in sync with the workout instructor. It’s not as much of a struggle to keep up. It’s not from doing regular workouts, as I have for years doing the same types of workouts. It feels as if the muscles and the nerve connection to the brain is improving. It feels as if this is making a difference in how I am moving. I LOVE IT. Day 27. I don’t run very often as it normally feels very hard to get the muscles in sync together. It feels like my legs will buckle and I will fall. It feels like I would hurt myself trying to do a movement most people take for granted. Normally when I try it feels forced, like my body struggles to remember how to move. I think it’s from the damage done by the multiple sclerosis. Today when I tried running up and down the hallway and into the living room those things weren’t an issue. My legs moved naturally as if I was a child. I didn’t have to work at being able to move my legs. While I know it’s only running in the hallway, I am safe if I should trip or fall. I am like a baby re-learning how to move my muscles in ways that used to be automatic. The thing is, I was able to run a few trips up and down the hallway and into the living room with ease. That is a big improvement for me. Yes, I do believe the E3Live is having very positive effects on the MS. While I am sure normal people make more progress than I have, I am thrilled at what I can do. Over time I would love to have the confidence to run outside. Maybe one day it will be possible. Day 29. My hips are a half inch smaller. My waist is smaller. My digestion is improving. Life seems so much brighter on E3Live. I take a shot glass full twice a day. Day 30. I don’t want to stop. I am hooked on the E3Live products. My weight has gone down 5 pounds !!! The juicing has helped with that. My body feels satisfied, like what ever nutrient I was needing is being met. The strength in my legs has improved as well as the my quality of life. It feels like my brain is functioning better. Thank you so much for letting me use the product. 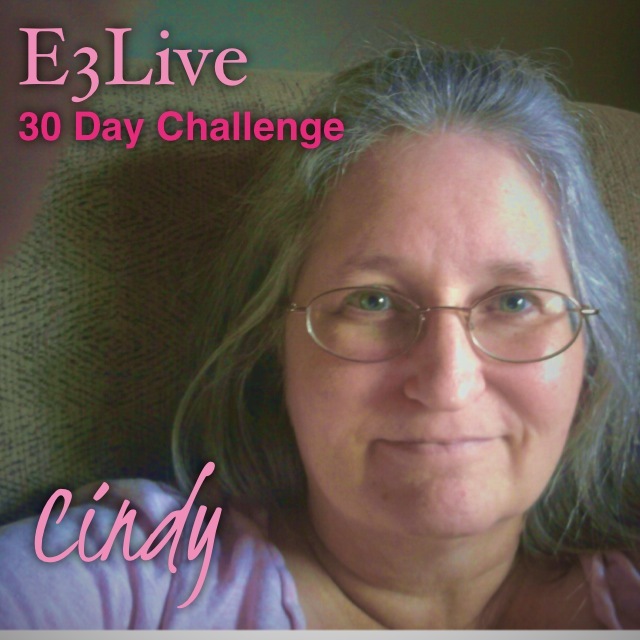 E3Live 30 Day Challenge – Meet Cindy! Meet Cindy! She is a 51 disabled RN who will be taking E3Live + BrainON and E3 RenewMe for 30 days. 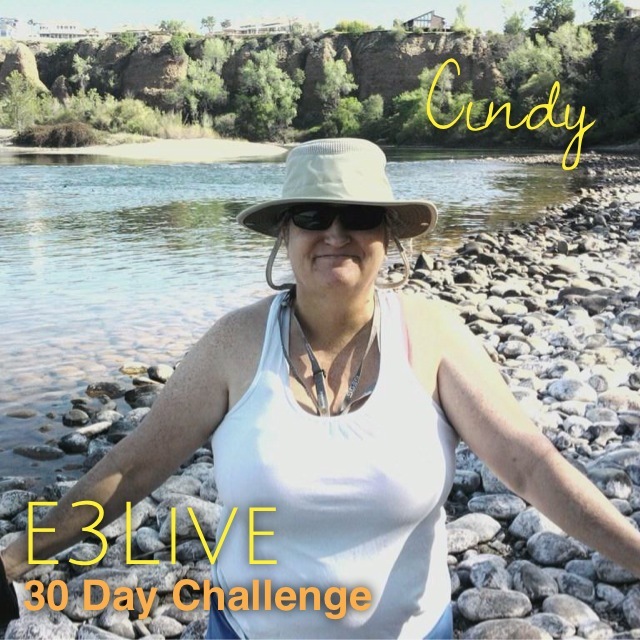 Cindy wants to improve her health, mobility, cognitive abilities and fitness levels. 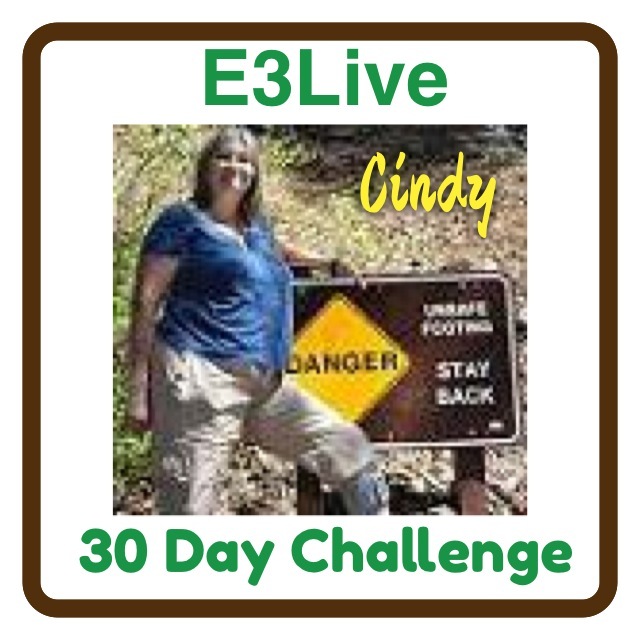 I am super thrilled to be part of the E3Live 30 day challenge. Wow is all I can say. With a knock on the door the box was left on the front porch. My precious box had arrived. It was well insulated and packed with loads of goodies. I received DVDs, a book, magnets, a shot glass, a few bottles of E3Live and Renew Me! It was like Christmas. It left me feeling teary eyed that I was picked. Defrosting my week’s supply of E3Live was quick and painless. My first dose was a tablespoon. It left me perky, energized, feeling rather alert like I had a cup of coffee. I love starting my day off with E3Live. I am the kind of person who notices changes rapidly. If I eat something good my body reacts positively. My body enjoys the E3Live. Its a good fit. If I consume something that disagrees with my system such as MSG or other things that I am sensitive to, my body crashes big time. My diet is vegan, mostly raw food. A typical day starts off with a quart of green juice that meets most of the RDA and is packed with protein. Lunch often is often some fruit with chopped nuts, maybe a green salad with lemon on top. Dinner is usually light. Sometimes more juice or a raw food meal, it just depends on how I feel. Goals. While I would love to loose weight, it is so challenging. My body hangs on to it. I tend to go for walks daily as my exercise or do a workout DVD at home. My workouts are challenging for me as I have multiple sclerosis. It makes it challenging as to the duration of the workouts and intensity. I don’t let the diagnosis hold me back, instead I eat in the optimal way for my body and workout to the best of my ability. Mostly I want to see how adding E3Live Brain on and the Renew Me will make me feel. I want to see if I feel more alive, alert, if I can do more. Day 2. I wake up and head to the fridge wanting my dose of E3Live. Down the hatch it goes. I drink it straight as the flavor isn’t bad. It makes my brain feel alert, ready for the day. I don’t drink coffee and I try to avoid caffeine so E3 Alive Brain on is my morning pick-me-up. Tomorrow I would like to increase the dose, adding in another tablespoon in the afternoon. I would like to see if it keeps me from hitting the afternoon slump. Day 3. I have added in a afternoon dose of the E3 Live. My energy feels a bit steady. My mind is alert into the evening. Day 4. I wake up feeling tired. I am not sure what is up other than maybe I am detoxing a bit. I just don’t feel 100%. It’s not bad, just a bit weaker, more fatigue, and a bit of dizziness. Hopefully it will pass soon. My body feels less stiffness. I think perhaps the Renew Me is helping to decrease the muscle spasicity or stiffness that goes along with MS. Sometimes when I stand up from sitting before the E3 challenge, my muscles would stiffen up. I would have to stand still waiting for them to loosen up before I could move. It feels like my muscles are looser. It’s easier to stand up and walk around without the pause as often. My back feels looser. It was injured a few years ago when a MD did emergency surgery on me for a different medical issue. He triggered something or injured something in my back. It’s been acting up ever since. It feels a bit looser easier to move. Day 5. Still detoxing. Today I am treating my body with patience and compassion. It’s time to soak in the sunshine and do gentle exercise, while I wait for the detox to pass. I don’t mind the detox. It’s good knowing my body is flushing out stuff I need to get rid of. When my mother was pregnant with me I was exposed to horrible toxins. Through my life I unknowingly was exposed to chemicals. It feels like they are being released, thank goodness. Day 6. I wake up early at dawn, early enough to watch the beautiful sunrise. My body CRAVES BrainON. When I wake up, I automatically go the the kitchen to get my fix. All is well. I feel good. The detox is releasing it’s hold on me. Day 7. Good Morning, I feel alert again when I wake up. The detox symptoms are minimal. I am going to hold my dose at 1 T. twice a day for a bit before I increase it again. It feels good to be back to my usual and maybe a bit more. Today I started doing Project Hope workout. It’s a beginner 20 min. workout which I broke up into two segments. Yes, I know I am out of shape. I have been working out for several years, but it’s been tough to make any progress when your battling a disease that messes with your physical strength. I do the best I can. In addition to this workout I am doing exercises that my physical therapist has me doing. I am also out doing small bits of gardening off and on during the day as my body tolerates. My legs are a little bit stronger. I can bend over a bit longer pulling weeds.